Caesar cocktails are an iconic Canadian bevy and in Toronto you’ll find them on menus at brunch, lunch and dinner. 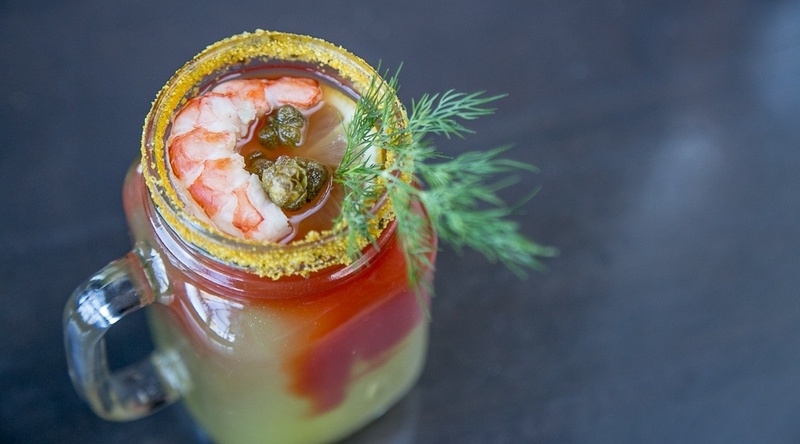 While the drink is traditionally crafted with a blend of vodka, clam stock, and tomato juice, stirred with horeradish, a hit of Worcestershire sauce, and a celery salt rim – in Toronto, bartenders aren’t shy to take liberties. In The 6ix, you’ll find Caesars spiked with a range of spirits, plus creative spins ranging from amped up garnishes to international riffs. Here are 10 must-try Caesars in Toronto. Adding a Middle Eastern twist on the classic, this Caesar is spiked with Sobieski vodka, spiced with harissa, and served in a sumac and za’atar rimmed glass. 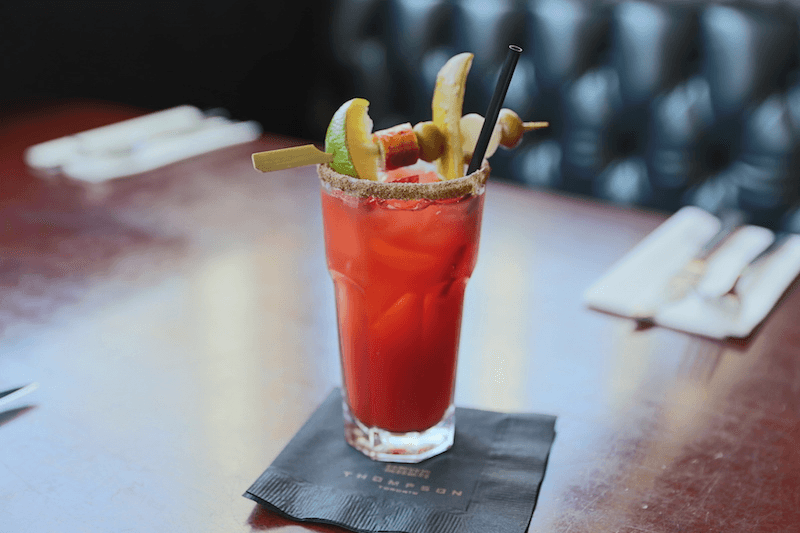 Designed to pair perfectly with the fruits from the sea on offer from the kitchen, this famous Toronto oyster house crafts their signature Caesars with Walter’s mix and a choice of tequila, bourbon, or scotch. Taking garnishes to the extreme, this retro ’90s bar likes to dress up its Caesar with nostalgic childhood snack foods including mini corn dogs and mac n’ cheese bites. Thompson Toronto’s new Turkey Sausage Caesar is just $5 at brunch on the weekends. The cheap and cheerful addition to the morning meal offers things to nibble on while you wait for your eggs. Garnishes include a cocktail onion, pickle, olive, celery salt rim and turkey sausage on a skewer. The smokehouse in the Port Lands looks for any opportunity to show off its meaty specialties. A smokey Caesar garnished with a rib has become a patio favourite. The Cure is this CityPlace bar’s answer to a hangover. Calling it over-the-top is an understatement, this thing features an entire meal among the garnishes; pizza, lobster tails, bacon, cheese, pickles… it’s all there. Weekend brunch is a seafood-studded affair at this fish and oyster house. The house Caesar blends vodka with Carroll & Co. Bloody mix, then finishes the drink off with Clamato, lime, and a freshly shucked oyster. The DIY Caesar bar here is stocked with all sorts of garnishes and hot sauces. Show some restraint with just a classic stick of celery or go all out decorating your bevy with cheese, veggies, eggs, pickles, pepperettes, and even wee little pigs in a blanket. The Bloody Jerk is a brunchtime favourite at this soul food spot on Queen West. This bevy is a true beast, spiked with vodka, jerk bitters, Harlem hot sauce, and horseradish, then garnished with a skewer of mini fried chicken and waffles, candied plantain, and a crunchy deep fried pickle. On the weekends, the Southern-style brunch menu at this Queen East restaurant offers seductive selections to eat and drink. From the Caesar bar, start with a choice of spirits (vodka, gin, tequila, or rye) and then choose from four different styles including the “Sea”sar that featuring layers of cucumber and tomato juice topped with a wild shrimp.